When I released Lammily crowdfunding on March 5, I could not have predicted such an overwhelming response. Now, with another eight days to go, more than 13,000 backers have preordered over 17,000 dolls. First and foremost, I want to say thank you to everyone who has made the Lammily campaign a success. Excited as I am about this initial success, I also share the concerns that have been expressed by many Lammily supporters and critics. The ultimate question many ask is what’s next, what will happen after the first-edition Lammily dolls are manufactured and shipped out? Lammily’s instant popularity was largely driven by a concern for body image. I believe this issue is of great magnitude. I myself have lived through my share of insecurities. Back in high school, I starved myself and exercised to exhaustion to have a set of six-pack abs. After achieving my desired BMI, I looked and felt terrible. This experience taught me to keep things in perspective. Every one of our bodies is different, so we should not be aspiring to some idealized standard. I’ve grown up alongside of my younger cousin. Now she is a 19-year-old competitive collegiate athlete and top student, a beautiful young woman and an inspirational person. All muscles, she used to call herself “fat.” She could only look “fat” if compared to exceptionally thin beauty standards. When I look at current fashion dolls, I’m reminded of my experience in high school and that of my cousin. I’m reminded that there are some things that are just a mirage and not worth emulating. Moreover, I’m reminded that there is beauty in embracing all the aspects of who you are, and in staying true to you. The foundation of Lammily is built on being true to yourself in a world that pressures you to conform to standards. I believe an entire world, with interactive resources, accessories, and clothes can be built to allow kids to find their own path. When you look at the current fashion doll market, you see it dominated by divas, princesses, and mermaids. You also see a lot of different careers, which these dolls promote, and I applaud them for that. However, what about the real steps you must take to achieve your dreams? I believe that one of the hardest things in life is to find your own path, something that is your calling. But, to find this calling, you cannot just pretend, you have to actively engage in reality. I want Lammily’s accessories to be reflective of real life in miniature form. I envision her reading books that inform and playing instruments that educate on the sounds and intricacies of music. I see her constructing her own home, cultivating her own garden while learning about the wonders of plants and vegetables and eating these nourishing and healthy foods. All of these aspects are authentic, and can be complimented with an online world where children can explore these realities in depth. Lammily’s wardrobe will be realistic as well. I can see her wearing outfits similar to what you buy. Lammily’s clothing line will incorporate a range of fashions so that there is something for everyone. And, if any clothing company would like to cooperate, I’m all ears! In the future, I see the Lammily line including dolls of different ethnicities and different healthy body shapes. I also see some special edition dolls based on inspirational role models: sports stars, actors, leaders. And, yes, of course I want the Lammily line to include male dolls. Some interpreted the crowdfunding campaign slogan “Average is Beautiful” as a message of aspiring to mediocrity or creating a new societal standard. However, I see “average” as inclusive of all of us, not a standard which excludes. I want to show that reality is beautiful, that life is beautiful, and there should be a line of dolls, which reflects this fact. Some criticism I have received is that Lammily is a weird name. However, Lammily is for the brand, not the name of any specific doll. It is derived from my last name and family, since my entire family helped me with the project. It purposely doesn’t sound like a common girl’s name. I encourage everyone who preordered Lammily to give their doll her own unique name as there will soon be an option to fill in and print out a passport for each Lammily doll at https://lammily.com. Lammily represents the idea of being true to yourself in a world that too often convinces us to pursue an unattainable fantasy. Join me in promoting the beauty of reality. Thank you to Smithsonian, USA Today, NBC, Upworthy, Time, Christian Science Monitor,The Atlantic, Business Insider, Yahoo Shine, Cosmo, HuffingtonPost, Fast Company,SparkLife, PolicyMic, Glamour, Take Part, Examiner, Mother Nature Network, Elle, Fitness , and many more, for reporting on the Lammily crowdfunding from the very beginning. I am hopeful you will take the next step into uncharted territory and make the Lammily line sexually and anatomically appropriate. I always wondered as a child why dolls didn’t have the appropriate sexual characteristics. It seemed somehow odd that they didn’t. I always have wondered why they did not. I am 62 and a grandmother and I would like to see this available. I would get these for my grandchildren. Perhaps it is the RN in me or that I grew up in a household that was relaxed on the issue but I see it as funny that no one ever addresses the issue. I can’t be the only one with views like this. I was one of the original crowd fund contributors. it’s about time thank you! I am highly looking forward to the male doll line before another female is released. Please have them have real hair but not as bushy as Ken’s rooted hair (maybe flocked). Another great idea is to make him anatomically correct (we don’t need to get crazy creative), but more realistic to the male form. Muscles are good too. Facial hair is another area that other manufacturers don’t emphasize on too much. I would love to be a part of this becoming a reality, as I have some great ideas. I buy Ken dolls all the time and transform them to look like a real male. Google Anatomically Correct Ken -eBay and you’ll more than likely see some of my previous work. I think whether or not you go so far as to create the doll in other shapes — curvier, shorter, taller, whatever — it’s hugely important that one of your next steps is to create the doll in other colors. I honestly think this should be one of the first actions you take as you expand your business. As important as it is to promote normal, healthy standards for body size and shape, the message gets lost a bit when the only doll available is white. The average WHITE person. It’s not promoting the same unhealthy beauty standards about bodies, but it’s still promoting (unintentionally, no doubt) white european beauty standards. As happy as those young children of color were to have a doll that looked more like a real person that they got to play with, how much happier would they be to have a doll who really looked like them, their mothers, their sisters, women they knew and grew up with, women they might be one day? This doll is a great first step in teaching young girls to be happy in their own skin, but the message is diluted if we’re only saying that to white girls. I got all emotional when I watched the video that showed the second graders reacting to Lammily… “She looks like my sister” some of the girls said. And this is true! There are so many girls I know who look just like her! Thank you so much for making this world a better place! Without a doubt, the Lammily family will continue to have success!! ps: I’m from Brazil and I LOVED the “exploring rio” outfit!! Hola les escribo desde Perú, la verdad estoy con gran expectativa de poder conseguir una de estas muñecas, la verdad me parece genial que esta idea de crear una muñeca con prototipos casi naturales a una mujer latina es super!por aquí hay grandes problemas sociales y uno de ellos es la bulimia y las niñas que están en etapa escolar imitan,la verdad tengo 28 años pronto a cumplir 29 y la verdad es un gran regalo de cumple! ohjalà pueda llegar una muñeca aquí a Perú . Please make this in more skin tones! This is wonderful! Thank you for making this- I can’t wait for a male doll (blue eyes, please, just cos my son has blue eyes…. ) and more diversity. I have been fascinated by the Lammily story since the beginning. I will not put all the blame on Barbies (oh how I loved them) and other alien-looking Bratz dolls (those too) for our deeply disturbing society standards; but it was about time a healthy-looking, life-like doll offered a different choice. Dolls are toys and it can be understood that they have “inhuman” shapes as they are part of a fantasy world; but they are everyday objects and models for kids and there should be more realistic alternatives to remind the children fantasy and reality are different, and reality is just as fun. Thank you for making this collective dream a reality and keeping up with a project which I am sure grew out of your original ambitions for it. As a young woman, I have seen the destructive effects of fanciful “beauty” social expectations, on my self-esteem as a teen, and on the health of a lot of my friends, male and female. The occurrence of eating disorders among young people (anywhere, not only in the US but on different continents) is appalling and truly a reflection of what the media focuses on. It is alarming that often, the illness is kept hidden until cured to family and friends. One of my friends, to this day – after university – still cannot accept her thin Asian body and dreams about an unhealthily tiny waist. I personally have wasted years in finding my path, years that should have been constructive, confused by social expectations for girls: appearances come first, not health, not brains, because if you don’t properly present yourself and interact with people you are too “weird”, too special to be taken seriously. Thank you for promoting a healthier lifestyle to the next generation, keep it up! I will now buy Lammily dolls for my friends’ kids, and then for my own. Great idea. I’m all for children growing up playing with more realistic/less sexualised dolls – but in the quest for achieving a “realistic” doll, I think it’s important to consider creating dolls who aren’t able-bodied. Sure, this would need to be treated sensitively, but the Lammily project has the opportunity to change the way children envisage beauty and reality, and so I think it’s pretty important. All I can say is a heartfelt THANK YOU! I too have known self esteem issues due to the “Barbie” era. It is wonderful to see change coming for my grandchildren to enjoy. Normal is what society seems to make it and it is past time for the “normal” to change to “reality”. I can not wait to see what comes next to your line of reality dolls. The world is a huge place and all cultures have different ideas of “normal”, I can’t wait to see other lines of cultural normal dolls to come. The world is a flower blooming with differences, embrace it! I think this is a terrific idea. When my girls were young I would not buy them “fashion dolls”, as they promoted such a distorted image, and, I felt, too old for young girls. My girls got the “Sunshine family” , who were more realistic and wholesome. I have high hopes for this doll, as I am sure there is a big market for her….. a lot of people would purchase this doll , if given a choice. I agree with all of the previous responses. This is a beautiful doll with a powerful message. The message can extend further, beyond body type. America is becoming increasingly diverse. It would be interesting to see dolls that not only have the “average” body type, but also reflect the ethnic and cultural melting pot that our country has and will continue to become. I also enjoy the idea of increasing the variety of clothing and professional wear. If Lammily expands to include more diversity in all features, Mr. Lamm you would be unstoppable! Keep up the good work. The possibilities are endless! I am a fashion designer for many types of dolls and so look forward to receiving your line. Lammily dolls will be a treat to play with. I ordered my girls for me and yes, I’m proud to say I still have a child in me and love to play. I do hope you expand your line to having males with the same degree of realism. Thank you for all your hard work. I’m so happy the dolls will be articulate. I’m a fan and I haven’t even received my dolls yet! Thank you for doing this . . . I can’t way it enough. I am 20 years old and have had body issues my whole life. As well as preordering one for myself, I intend to get them for my two young nieces who “love Barbie’s” at the moment. They are 4 and 6, and I want them to grow up knowing what real beauty looks like. Thankyou thankyou thankyou! I am so excited to FINALLY see a doll who will more realistically reflect what the “average girl” looks like, and like others who have posted, would like to encourage you as thing move forward to expanding choices in skin tones, hair, eye color, etc. as word spreads about your efforts. 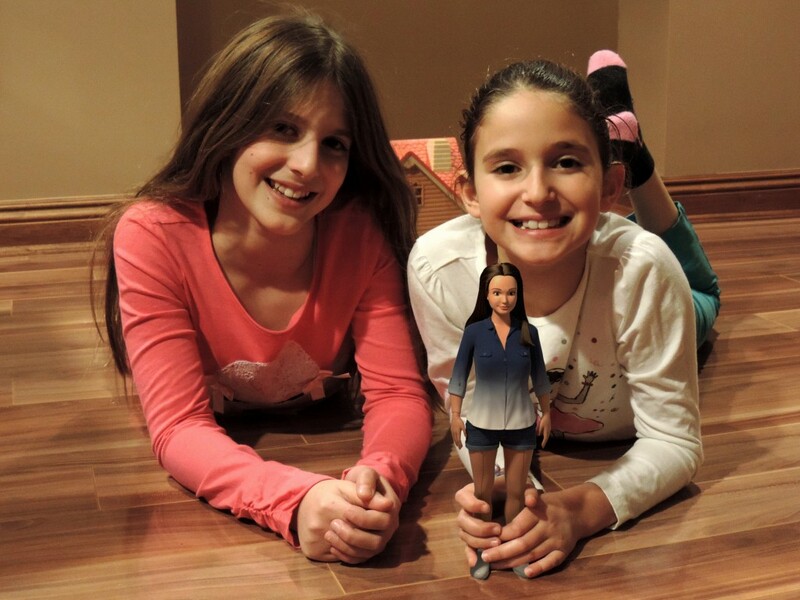 I would also like to enourage you to reach out the Girl Scouts USA (and other groups who work to help young women who are developing their sense-of-self) to create clothing & accessory options for future LAMMILY dolls! Thank you so much for creating this doll! I am so excited about the future of your company and so thankful for this healthy option for our children! I too remember growing up with experiences of cousins and a sister who would constantly compare themselves with billboard and magazine models, going to great lengths in attempts to emulate the aesthetics that our society has held as a standard for beauty. I have personally seen the negative effects these standards have had on our youth, both female and male, and am a proponent for the redefining of harmful, social expectations. Having two daughters of my own, I can certainly appreciate your efforts in addressing this issue. I look forward in helping to further support your concepts. I was excited to receive my email today and read about the progress of Lammily.. giving her a real name will be my first step to showing my 2 current great-granddaughters “Average is Beautiful’ .. I will name the dolls I ordered accordingly.. both great-granddaughters are American/Hispanic mix, and one granddaughter is American/Filipino mix.. I am so loving the fact that the first dolls are dark hair and resemble all 3 of the girls. My next 2 great-granddaughters will be blondes as both sets of parents are the white haired blondes.. by that time the new group of Lammily Family dolls my have a blonde. I am 65 and just thinking it’s strange how many of us growing up thought about the average body doll and never did anything about.. Kudos to the Lammily Family!! I am so excited to hear from you in confirmation that this project is going forward due to the overwhelming response and pre-orders. I am a 73 year old doll collector and I can’t wait to get my first edition Lammily brand, “Average is Beautiful” doll, that I pre-ordered in March.I too had body image issues growing up and totally understand and applaud your incite and effort to promote good self esteem to our youth, which is when they are most impressionable. Yea to You!! !